We’d love your help. Let us know what’s wrong with this preview of The Middle Passage by James Hollis. Why do so many go through so much disruption in their middle years? Why then? Why do we consider it to be a crisis? The Middle Passage presents us with an opportunity to reexamine our lives and to ask: "Who am I apart from my history and the roles I have played?" It is an occasion for redefining and reorienting the personality, a necessary rite of passage between the exten Why do so many go through so much disruption in their middle years? Why then? Why do we consider it to be a crisis? The Middle Passage presents us with an opportunity to reexamine our lives and to ask: "Who am I apart from my history and the roles I have played?" It is an occasion for redefining and reorienting the personality, a necessary rite of passage between the extended adolescence of the first adulthood and our inevitable appointment with old age and mortality. How did we acquire our original sense of self? What are the changes that herald the Middle Passage? How does one revision the sense of self? What is the relationship between Jung's concept of individuation and our commitment to others? What attitudes and behavior support individuation and help us move from misery to meaning? This book shows how we may travel the Middle Passage consciously, thereby rendering our lives more meaningful and the second half of life immeasurably richer. To ask other readers questions about The Middle Passage, please sign up. I believe some books come to you when you need them and are ready to receive them. If The Middle Passage had come to me a few years ago, I wonder if it would have held my interest or even been intelligible to me. Last year, this was recommended by a stranger - a psychologist - and even though I bought it immediately, its turn to be read came only yesterday. And through most of the night (such was the unfolding excitement of reading it) and some of the day, I read it in large gulps. It is a book b I believe some books come to you when you need them and are ready to receive them. If The Middle Passage had come to me a few years ago, I wonder if it would have held my interest or even been intelligible to me. Last year, this was recommended by a stranger - a psychologist - and even though I bought it immediately, its turn to be read came only yesterday. And through most of the night (such was the unfolding excitement of reading it) and some of the day, I read it in large gulps. It is a book by a Jungian psychologist about that important passage in our life, known mostly as the midlife crisis. The book makes a persuasive argument for how we come to acquire self-identities that take us farther from our real Self. We confuse our Ego for who we are, our roles for our purpose and the form for the real thing. We forget that we, the human beings, are 'Human' of course, but are also 'Beings'. The more we embrace our acquired identities, the more we give rise to dissatisfaction in our mid-life, an envelope of anxiety and unease that does not go away simply because we are 'successful'. It talks at length on man-woman relationship particularly in the context of marriage and of parenting. The book exhorts is to take charge of the ship and launch a journey inwards. It offers a few suggestions and clues on how to navigate during this voyage of Self discovery. To know oneself is both the goal and the journey. This is a jungian based book on finding meaning in this crazy world we inhabit. It helps to explain why we make the choices we do and possibly avoid the ones that bring us misery and choose the ones that bring meaning into our short lives. This is not an easy ready. I've read it three times - once for over all concept, two for understanding and three to reinforce concepts. But I credit this book for saving me from myself. If you're feeling depressed and unsatisfied with your life, it could be a really positive sign. That's the big message of this small book because rather than running your life round what your parent's, society or your partner feels is right, you might be ready to be true to yourself. Going through a mid-life crisis is incredibly difficult (or having your partner stuck in one!) but a lot of the problem is that we have no context or understanding what's happening. I would like to recommend this bo If you're feeling depressed and unsatisfied with your life, it could be a really positive sign. That's the big message of this small book because rather than running your life round what your parent's, society or your partner feels is right, you might be ready to be true to yourself. Absolutely everyone should read this book- and I mean everyone- past the age of 35 could gain insight from this. I could quote this book all day long- Hollis explains concepts based in Jungian theory and lays it out in a way that is easy to understand, grasp and appreciate. Despite what your beliefs might be, you can see the truth in his words and you can't deny them. The Middle Passage sat on my shelf for almost a year after buying it- I read the first chapter and a half and it was making me fe Absolutely everyone should read this book- and I mean everyone- past the age of 35 could gain insight from this. I could quote this book all day long- Hollis explains concepts based in Jungian theory and lays it out in a way that is easy to understand, grasp and appreciate. Despite what your beliefs might be, you can see the truth in his words and you can't deny them. The Middle Passage sat on my shelf for almost a year after buying it- I read the first chapter and a half and it was making me feel depressed so I put it down. But no wonder- It might be so that one must be "ready" to read this before they can commit to it... this time I devoured it and even read a few chapters over again before moving to the next. I picked this book up shortly after finishing another Hollis book called "Why Good People Do Bad Things." I was so impressed by that book that I wanted to delve further into Hollis' Jungian take on life and I was not disappointed. "The Middle Passage" examines many of the same concepts but focuses more on that time in our life when we seem to seek meaning with greater desperation than when we were younger. It really is a special time and this book encourages the reader to not only celebrate the g I picked this book up shortly after finishing another Hollis book called "Why Good People Do Bad Things." I was so impressed by that book that I wanted to delve further into Hollis' Jungian take on life and I was not disappointed. "The Middle Passage" examines many of the same concepts but focuses more on that time in our life when we seem to seek meaning with greater desperation than when we were younger. It really is a special time and this book encourages the reader to not only celebrate the gifts this milestone in life provides, but to furthermore seize the opportunities to re-define ourselves on our own terms and once and for all destroy the roots of angst and frustration. This book helps make sense of the jumble of conflicted emotions, duplicity, and self-destructiveness that lingers in all of us and comes to an ugly head during this transitional phase of life. Understanding the why and what is the most beneficial tool that Hollis provides, and armed with it, I can dissect myself with the precision and sense of purpose that had heretofore been little more than shouts into the void and the maddening cycle of failure. As a teacher, I can appreciate the value in being given the chance to help myself instead of being provided with water-downed solutions that build no independence and problem-solving skills. Hollis does just that and I will forever be indebted to his wealth of understanding of the human psyche and his willingness to share it with the rest of us. This is the book I've been looking for forever, since I experienced my own "middle passage" in the early 2000s. Finally a book to help validate ALL of my perceptions,feelings and emotions as I transitioned into my second life, one filled with new fulfillment and meaning. Much I have read says there is no such thing as a "midlife crisis" but as a psychotherapist focused on midlife, and as the self-proclaimed Midlife Crisis Queen online, I hear from others everyday who know that midlife can be an i This is the book I've been looking for forever, since I experienced my own "middle passage" in the early 2000s. Finally a book to help validate ALL of my perceptions,feelings and emotions as I transitioned into my second life, one filled with new fulfillment and meaning. Much I have read says there is no such thing as a "midlife crisis" but as a psychotherapist focused on midlife, and as the self-proclaimed Midlife Crisis Queen online, I hear from others everyday who know that midlife can be an important passage from being who everyone told us to be, to who we are inside! It's all about finally accepting and appreciating your own authentic self. Lucid, scholarly, and easy to comprehend this influential book by Hollis answers the question: What is our task in mid-life? In his words, "The act of consciousness is central; otherwise we are overrun by the complexes. The hero in each of us is required to answer the call of individuation. We must turn away from the cacaphony of the outer world to hear the inner voice. When we can dare to live its promptings, then we achieve personhood. We may become strangers to those who thought they knew us, Lucid, scholarly, and easy to comprehend this influential book by Hollis answers the question: What is our task in mid-life? In his words, "The act of consciousness is central; otherwise we are overrun by the complexes. The hero in each of us is required to answer the call of individuation. We must turn away from the cacaphony of the outer world to hear the inner voice. When we can dare to live its promptings, then we achieve personhood. We may become strangers to those who thought they knew us, but at least we are no longer strangers to ourselves...Recall Jung's central question. 'Are we related to something infinite or not?'" 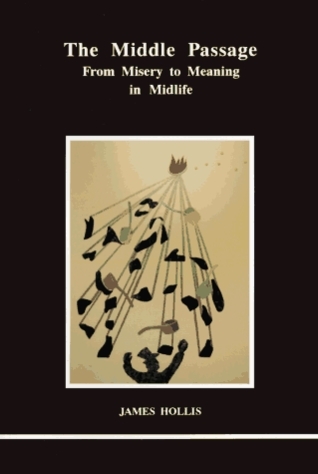 This is a wonderful insightful book about mid-life transition. It touches on projections and moves you to an understanding in the area of what holds us back from expressing ourselves and listing to our own truth. Hollis is a master at explaining difficult concepts with a clear readable diction that helps you to understand and grow. I love James Hollis. And I liked this book. But I have to say, I liked his more recent book on the same subject (Finding Meaning in the Second Half of Life: How to Finally, Really Grow Up) even more. May as well go ahead and spoil yourself rotten and read em both! A must read for anyone going thru the dreaded "mid-life crisis". Illuminating thoughts on relationship dynamics. A lot of things to think about here about why people feel feelings of crisis at midlife. Like his other book I read, it can be a little slow going, despite how short it is. I love the style of his writing personally, but it does take a bit more attention to read than other styles. Not much in the way of solutions, typical vague "know thyself" "you'll find the answers within" stuff, but still profound in the attention it brings to what people are going through in that time period and why and a vag A lot of things to think about here about why people feel feelings of crisis at midlife. Not much in the way of solutions, typical vague "know thyself" "you'll find the answers within" stuff, but still profound in the attention it brings to what people are going through in that time period and why and a vague outline of what needs to be accomplished although not much in terms of concrete strategies. Anyone who has felt disillusioned by life and found themselves questioning who they are "apart from [their] history and the roles [they've] played" - who they really are - will find this book incredibly insightful. In the end this book doesn't have the answers or even a blueprint for the answers, but it does allow us to live more consciously and increasingly become more aware of ourselves. Hollis' language is, at times, a bit academic, and some of the case studies in literature were hard to ident Anyone who has felt disillusioned by life and found themselves questioning who they are "apart from [their] history and the roles [they've] played" - who they really are - will find this book incredibly insightful. In the end this book doesn't have the answers or even a blueprint for the answers, but it does allow us to live more consciously and increasingly become more aware of ourselves. Почему мне понравилось: потому что все по полочкам и разжевывается максимально. Потому что это не популярная психология и поэтому тут нет воды. Потому что книга не основывается на жизненных примерах других людей (а это такая задолбавшая тема). Потому что здесь сплошная полезная информация, поданная понятным языком. Потому что с полученной информацией можно работать. Не будет преувеличением сказать, что... Книги Холлиса как священное писание для меня. It’s about not just he middle crisis, but a very short and precise info on the applied psychology aspects, fixing which you could make your life better. So useful and maybe it is so for me because I was in therapy for some time and all the concepts he suggested were partially experienced and lived through. Like a “what to expect...” for middle-age, only in really thick psycho-lingo. Totally worth it. Highly recommended. If you do read this, please come over and have some tea or wine and tell me what you think. I was impressed by how thoughtful this was. It is speaking about how to deal with "the second adulthood" and guides a reader into the work to do toward what Jung calls "individuation" or what we might simply call maturity. This is one of the best books ever written about middle age! The perfect book for managing the mid-life crisis. Well-written, insightful and a very informative read. Outstanding insight, cogent & pithy writing, and powerful framework for thinking and - more importantly - being via growing into one's 'second adulthood'... So good, I read it twice! The best book about the mid-life crisis, hands down. There are definitely hidden gems in the book and it is a book well worth reading. However, it is often quite obscure, the style is at times overly abstract and verging on pomposity. Concrete examples are rare and bizarre. It is often not quite clear how they illustrate the more abstract ideas. Philosophically, Hollis never seems to make explicit his assumptions, some of which appear to border on essentialism (e.g., assuming the existence of a "true-self", an "authentic-self", which seems to be f There are definitely hidden gems in the book and it is a book well worth reading. However, it is often quite obscure, the style is at times overly abstract and verging on pomposity. Concrete examples are rare and bizarre. It is often not quite clear how they illustrate the more abstract ideas. Philosophically, Hollis never seems to make explicit his assumptions, some of which appear to border on essentialism (e.g., assuming the existence of a "true-self", an "authentic-self", which seems to be fixed(? ), necessary(?) and unchanging(? )), not to mention engaging in a debate on his assumptions. Finally, there is an error that seems to reflect a general sloppiness in the author's thinking. Jeremy Bentham's embalmed body is apparently kept in University College London, not at the London School of Economics as Hollis tells us in page 111. It could be interesting to compare this book to Grosz's book - The Examined Life. Both seem to say that it is precisely the source of human suffering that offers a path to redemption. But Grosz is much more nuanced, hesitant and personal in the story he tells, Hollis more arrogant, absolute, unquestioning, lacking a self-critical, self-reflective discourse. Книга юнговского аналитика James Hollis про непройденный кризис взросления, тот самый перевал на пути от подростковой жизни со всеми её сложностями вписывания в социум, следования правилам той культуры, где ты живёшь, сильного влияния родителей и других значимых людей к взрослой жизни, с не меньшими сложностями ответственности за свою жизнь, принятии осознанных решений, пути на встречу страхам и желанию более глубокого познания себя, других и своего развития. "Кризис среднего возраста" - очень у Книга юнговского аналитика James Hollis про непройденный кризис взросления, тот самый перевал на пути от подростковой жизни со всеми её сложностями вписывания в социум, следования правилам той культуры, где ты живёшь, сильного влияния родителей и других значимых людей к взрослой жизни, с не меньшими сложностями ответственности за свою жизнь, принятии осознанных решений, пути на встречу страхам и желанию более глубокого познания себя, других и своего развития. "Кризис среднего возраста" - очень условное понятие ибо возраст не так уж важен. Важен именно этот период, когда начинаешь задумываться над фундаментальными вопросами типа "Что останется, если снять все мои маски и выйти из всех играемых ролей? ", "Кто я?" По опыту общения со многими друзьями, знакомыми и просто людьми, встреченными на пути, я могу сказать, что слышала про этот период очень, очень много раз от людей самого разного возраста и самым разным опытом. Книга помогает не застрять на этом перевале, не пугаться его, а продолжить свой путь. This review pertains to the unabridged Audible version of the book. I enjoyed the content of this book, and I liked the various anecdotes and illustrations. However, it is fairly heavy on the Jungian concepts and jargon, so at times it seemed rather abstract and hard to follow on an audio basis. Also, the narrator has an even, expression-less style that perhaps is useful because it conveys no judgment -- but it also conveys no excitement or interest. Indeed, my player ( Good Info, Boring Narration. Also, the narrator has an even, expression-less style that perhaps is useful because it conveys no judgment -- but it also conveys no excitement or interest. Indeed, my player (the Audible app for iPhone) would go right from one chapter into the next without even a pause. This book is the secret decoder ring to the midlife crisis we go through around 38 - 42. After reading this, that whole chaotic period made sense, even though little of it made sense at the time. Just before you buy that red sports car, or worse... this might be the book to read. We have given this book to many friends as they passed through this tumultuous period. Not too early--we all need to experience our world falling apart. Otherwise, how would we learn anything? But in the middle, when it's This book is the secret decoder ring to the midlife crisis we go through around 38 - 42. After reading this, that whole chaotic period made sense, even though little of it made sense at the time. We have given this book to many friends as they passed through this tumultuous period. Not too early--we all need to experience our world falling apart. Otherwise, how would we learn anything? But in the middle, when it's all getting very confusing. James Hollis, Ph. D. is Executive Director of the Jung Center of Houston, TX, a practicing Jungian Analyst (psychotherapy developed by C.G. Jung - the eminent Swiss psychiatrist), and author of eleven books.